Wire (wire-o) binding is the perfect choice for training manuals, presentations, theses and reports . 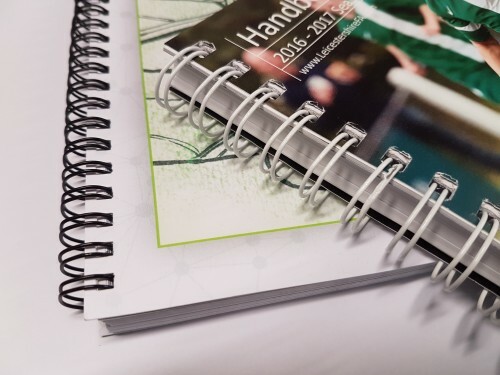 Wire-o bound books are the perfect choice for training manuals, presentations, reports; in fact any book where the pages need to lay completely flat making it easy to write in them or leaving both hands free for typing. Flexpress offer a wide choice of cover options and several weights of uncoated papers for wire-o bound books. Uncoated papers are by far the most popular option for the pages in this kind of book as it facilitates the easy use of pens for making notes. Every job at Flexpress is printed using the finest technology available. You wont receive any products printed on beefed-up photocopiers from us - another reason we back everything with our total satisfaction guarantee. This product is printed either lithographically using LED UV inks or using HP Indigo which is arguably the finest digital technology available. Wire-o binding manually is a relatively slow process so to ensure we meet challenging deadlines, Flexpress use automated punching machinery and electric closing equipment which dramatically speeds up the binding process. All books are bound in your choice of black or white wires with the seam of the book discretely hidden within the inside back cover. This is the correct way to wire-bind a book and also ensures the pages can't fall out. As with all our products books are packed in extra-strong, double-walled, unbranded cartons that will stand up to the rigours of national carriage. Covers are available with your preferred choice of gloss, matt or soft-touch laminates. All orders are dispatched by reputable national carriers on a next working day service. This will usually arrive by 5pm although please be aware once goods have left our premises we have no influence on when they are delivered. If you would like to upgrade to an AM or Saturday delivery, please contact admin@flexpress.co.uk who can arrange this for an additional cost.